Remember that scene in Clueless where Cher (played by Alicia Silverstone) is being held at gunpoint but refuses to drop to the ground because it might ruin her dress? “Oh, no,” she pleads. “You don’t understand; this is an Alaïa.” Yes, we just quoted Clueless to make a point, but here it is: You don’t refuse an armed gunman’s request for just any designer. Would Cher have hesitated the same way if she were wearing Forever 21? We think not. “You don’t understand; this is an Alaïa,” Cher pleads to an armed robber in Clueless. 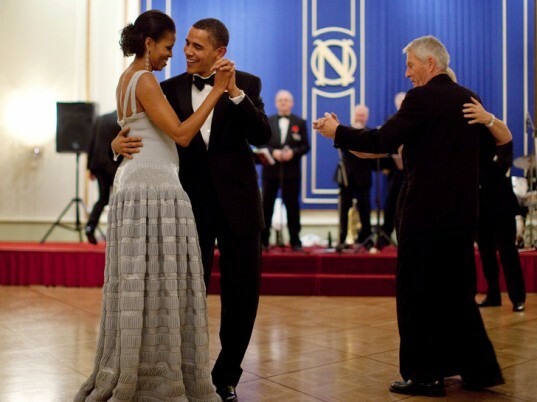 First Lady Michelle Obama wore Azzedine Alaia at the Nobel Peace Prize ceremony in 2009. Thinking in terms of Spring/Summer, Resort, Pre-Fall, and Fall/Winter is outmoded and unnecessary, says Alaïa. Another reason why Alaïa is so revered is that his clothes are so breathtaking that calling them “clothes” seems inadequate. He still pieces each dress together with his own hands in his own home. (If that isn’t quality control, we don’t know what is.) Many women around the globe would hurt and maim to get their mitts on one of his masterpieces and once they do, they don’t let go. And since each pieces costs thousands of dollars, you’d have to be as gaga as Galliano to throw anything away; so, yeah, you won’t find any Alaïas contributing to the trash in our landfills, either. So did this fashion legend’s opinions about slow fashion change your mind about how you’re going to consume clothes? Tell us why or why not in the comments. This is absolutely brilliant and states so eloquently the things I've been saying for a while now. True art can't be rushed. Sometimes it happens quickly; sometimes it takes years to finish a piece properly. Vermeer (the painter) didn't churn out hundreds of paintings - instead, he took his time and created a small set of gorgeous masterpieces that still inspire us today. I'm relieved to hear this fashion icon advocating for a return to sanity in production and true creativity in design. Maybe if we designers didn't cater to The Machine, our patrons would appreciate the ART in design much more...and be willing to compensate us more appropriately, too. Designer Azzedine Ala�a Says Current Pace of Fashion is "Inhuman"
Unless you've been living under a rock with those guys from that Geico commercial, you're probably used to fast fashion�wear it today, trash it tomorrow. But fashion's ruthless pace isn't just unsustainable, it's also "inhuman," according to designer Azzedine Ala�a. "Today there is no time for creativity; nobody has time to develop a special silhouette or a special fabric," the Tunisian-born couturier tells the Business of Fashion. "Four collections for women, four collections for men, another four collections to sell, and everything needs do be done within four, five months�it�s a one-way course towards emptiness. It�s inhuman."